Toward that end, Thongloun apparently wants to project an image of an independent country -- rather than a client of China -- and secure economic assistance from the U.S. and Europe. Thongloun has quickly sought to show he is cut from a different cloth than his predecessors. In June, he set out on a nationwide tour to inspect controls on illegal timber exports. These exports are estimated to have cost the Laotian economy several billions of kip, or hundreds of thousands of dollars. A lot of the wood ends up in China, along with Vietnam. The national media covered Thongloun's tour, which attracted significant public attention. Stopping illegal timber exports is a key plank of the prime minister's reform platform. The shipments are thought to have benefited interests tied to the Laotian military. But Thongloun went on national TV and asserted that the transactions threaten the livelihoods of rural residents. Thongloun is also looking at ways to tackle high electricity bills and improve the education system. And he launched a review of major investment projects involving foreign capital -- with direct implications for China. In early July, an independent media outlet reported that a Chinese company had withdrawn its bid for a national road project. The sole bidder had put a $49 million price tag on the project -- a cost some considered exorbitant. Thongloun attempted to negotiate a lower price, according to the report, but the talks broke down. The reform campaign comes as the government works to contain simmering public discontent. The rise of social media is complicating matters, according to Norihiko Yamada, a researcher with the Institute of Developing Economies of the Japan External Trade Organization. "Social networking caught on in the country just as the People's Revolutionary Party was increasingly losing trust, with a growing gap between cities and rural areas," Yamada explained. "This has allowed the public to vent frustration against the government." If that frustration were to boil over, Yamada said, it could shake the very foundation of Laos' governmental structure. The growing influence of China, meanwhile, has stirred resentment. China accounted for some 40% of foreign direct investment in Laos in 2015, up from about 30% a decade earlier. Some projects, critics say, are geared too heavily in favor of the neighbor. There have also been issues with project suspensions and environmental degradation. Thongloun's travel schedule offers further evidence of his turn away from China. After his inauguration, the prime minister's first destinations were Vietnam and Thailand, in that order. In stark contrast to his predecessors, he has yet to visit China. 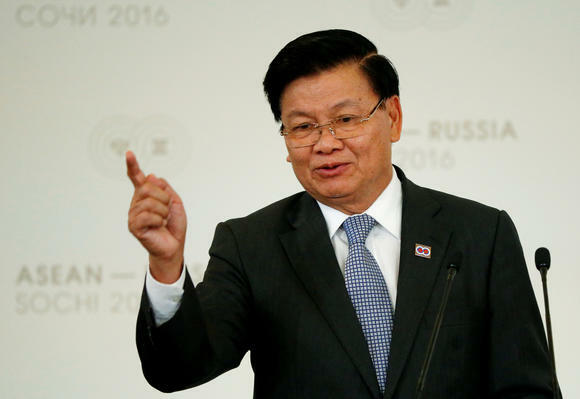 Reducing Laos' reliance on China will be no easy task. A diplomatic source warned that Thongloun could risk antagonizing Beijing. That, in turn, could jeopardize the Laotian government's growth target of 7.5%. Waiting in the wings, however, is the U.S. Washington has already begun making overtures to Laos -- apparently as a way of putting pressure on China over its territorial claims in the South China Sea. U.S. Secretary of State John Kerry has visited Laos twice this year. In early September, Barack Obama is set to become the first sitting U.S. president to visit the country, when he attends the East Asia Summit in Vientiane.